Throughout November, we have been counting down to Thanksgiving by posting daily thanks on Facebook. There is some overlap with our lists from Thanksgiving in 2012 and 2014, and so much more to add – it is amazing how much there is to be grateful for! Here are those daily posts – these were in no particular order, and it is by no means a complete list! Day 1: … long-time park supervisor James Stokes, Jr. for his years of care for the park. He started work on October 31, 1935 and continued for at least 25 years, and by all accounts really loved Glen Providence Park. He served as park guard, caretaker, supervisor, and park ranger – personally building picnic tables, preparing for concerts, planting trees & flowers, teaching visitors about the plants & wildlife, and creating the 1941 Nature Guide to Glen Providence Park! Day 2: … the local schools that use Glen Providence Park as an outdoor classroom and for service learning, teaching their students a love of nature, science, art, and more. Thank you Media Elementary School, Springton Lake Middle School, Media Providence Friends School, Penncrest High School – and homeschoolers! Day 3: … Delaware County Parks & Recreation, for resurfacing the historical WPA stage last summer in time for the park’s 80th anniversary celebration, for their support of our events and activities, and for their many years of caretaking and managing their 621 acres (and growing!) of open space for the public. Day 4: … all that Chester-Ridley-Crum Watersheds Association has done since 1970 to protect, conserve, and restore the watersheds throughout its 132 square mile stewardship area! Its initiatives include annual streams cleanups, riparian reforestation, advocacy, education, and stream monitoring. We are honored to receive their Organizational Stewardship Award this year! Day 5: … our Nature Walk guides and monthly event leaders who volunteered their time in the past two years: the ever-helpful Al Guarente of the Birding Club of Delaware County, Gary Stolz, David Hewitt, Shannon Davidson, Marcia Tate, Stephanie Gaboriault, Kyle Loucks, George Tate, the Media-Upper Providence Free Library, Holly Hoffmann, Aura Lester, and Charles Randall. Day 6: … Taylor Memorial Arboretum in Wallingford, for generously growing and donating native trees and shrubs each year for habitat restoration plantings by other organizations – including for our past four National Public Lands Days! Day 8: … EllieReed Lewis and Clifford Butler Lewis, the grandchildren of park donors George and Eleanor Butler – for sharing their recollections from childhood in Glen Providence Park, and for celebrating the park’s 80th anniversary with us last summer! Day 9: … our Invasive Plant Removal volunteers, who meet most Friday mornings to work in the park. In the past 4 years, they have cleared over 250 packed contractor bags of invasive plants – keeping trails clear, liberating native plants from strangling vines, improving habitat, and beautifying the park. Day 10: … those who have made our historical research possible, including the Media Historic Archives, the Delaware County Historical Society, and the Newspaper Archives of Delaware County Library – and Delaware County, PA History for sharing our history-related facebook posts. Day 11: … the Girl Scouts and Boy Scouts for their years of involvement in Glen Providence Park going back to at least 1939 – with hikes, cookouts, award ceremonies, meetings, and community service. In the past few years, Brownie Troop #5248 and Minquas District Boy Scouts have volunteered, and Girl Scout Troop #5037 and Pack 503’s Webelos II have had meetings and outings in the park! Day 12: … our wonderfully generous Concert Sponsors: Media Recreation Board, Media Rotary Foundation, Diego’s Cantina, Seven Stones Café, Shere-e-Punjab Indian Restaurant, Sterling Pig, and Tagine, who made it possible for us to revive the decades-long tradition of free summer concerts in Glen Providence Park. Day 13: … Media Lions Club and McCarrin Chiropractic, for continuing Glen Providence Park’s longest-running tradition – the Great Media Easter Egg Hunt started in 1954! The Lions have worked since 1917 to fight blindness, and on many other community projects. Day 14: … the American Chestnut Foundation, for their work to restore this once-majestic native tree, decimated by blight in the early 1900’s. Chestnuts were called the Sequoias of the east, and we know from T. Chalkley Palmer’s 1889 writings that the park’s eastern hill was once “continuously wooded with oaks and chestnuts.” We have found two surviving trees so far! Day 15: … all of the volunteers who have spent their free time working for Glen Providence Park through the years – our dedicated committee members, the dozens of people who have helped at our 17 volunteer days, and all those who volunteered in the park before us. Day 17: … Samuel L. Smedley, who with great foresight and wisdom in 1927 urged regional planning for open space, and spearheaded the creation of Delaware County Parks & Recreation, which was used as a model nationally for its excellent planning. He personally helped create and plan Glen Providence Park. Day 18: … all of those who appreciate our efforts to preserve and enhance Glen Providence Park – whether by reading our newsletter and website, attending our concerts and nature walks, or saying a kind word when they see us in the park – and of course our Facebook fans! Day 19: … the Delaware County Conservation District for their guidance, mini-grants, donations, use of their Conservation Trailer, and support for our native plantings over the past 5 years – helping us to combat streamside erosion, restore habitat, provide food for wildlife, and beautify the park. Day 20: … our donors, whose generous support enables us to continue our work to improve the park and plan future concerts, plantings, events, and activities! 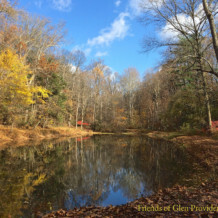 Day 21: … the array of wildlife, native plants, and all living things in the park, which with the changing seasons provide something new to discover on every walk in Glen Providence Park. Day 22: … Hedgerow Theatre, for their enchanting performances at the WPA stage – enacting the park’s historical Newlywed Ghost and Witch Stories for Glen Providence’s 80th anniversary last year, and bringing Shakespeare to the park this summer! Day 23: … T. Chalkley Palmer, 1860-1934, for writing in loving detail about Scroggie Valley in 1889, enabling us all these years later to read about the geology, landscape, flora, and fauna of Glen Providence Park as it was in the 1800′s. He also had remarkable environmental insights for his time. What a gift! Day 24 of Thanks: We are so thankful for George and Eleanor Butler, who with great generosity and foresight in 1935 donated most of the land for Glen Providence Park as a Bird Sanctuary and Arboretum, to be preserved for future generations. There would be no park without them – we are incredibly grateful!